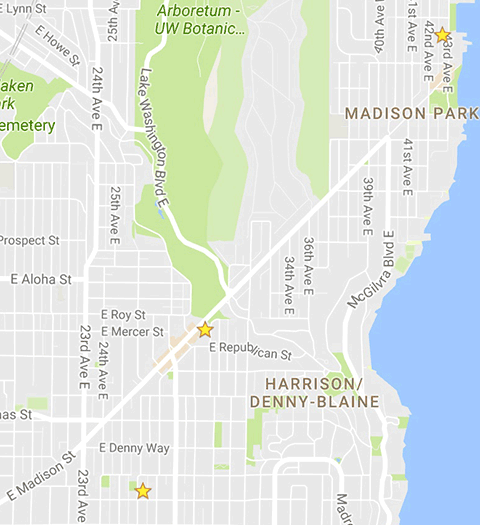 Here are the Seattle OPCD and SDCI Land Use notices in the last three weeks for communities from 18th Ave. to Lake Washington and E Union St. to SR-520. Design Review Early Design Guidance application proposing a 3-story apartment building containing 12 apartment units. Below grade parking for 14 vehicles to be provided. Existing structures to be demolished. Zone: Lowrise-3, Urban residential, Arterial within 100 ft.
Wednesday, May 31, 2017 at 6:30 p.m. The Seattle Department of Construction and Inspections (SDCI) is currently reviewing the application for, and will hold a public meeting to gather comments on, Land Use Application to allow a 6-story building consisting of 82 residential units above 26,250 sq. ft. of retail space, located at ground level. Parking to be provided for 140 vehicles at and below grade. Existing structure to be demolished. Zone: Neighborhood Commercial 2-30′ Pedestrian, Neighborhood Commercial 2-40′ Pedestrian, Single Family 5000, Liquefaction prone soils, Steep slope (>=40%), Arterial within 100 ft.
Tuesday, June 6, 2017 at 6:30 p.m. The Seattle City Council is considering proposed legislation that would strengthen standards for securing vacant buildings, establish an expedited process for removal of garbage and other debris from sites with vacant buildings, establish an expedited process for demolition of hazardous vacant buildings, and reduce the amount of time that a building on a site in the development permitting process must remain vacant prior to demolition. Tuesday, June 20, 2017 at 9:30 a.m.